Keith Cleary Plant Hire Ltd has gained an enviable reputation for delivering high quality projects in their chosen areas of expertise. Irish Trucker caught up with Managing Director Keith Cleary who operates a modern fleet of well maintained plant and machinery. Based in Drumbar, County Donegal, Keith Cleary Plant Hire Ltd is one of the leading Plant Hire specialists in the north west of Ireland and beyond. A family owned and operated business with a reputation for quality and reliability, they have the experience to tailor a package of equipment and skilled operators to fulfill their customers' site requirements. 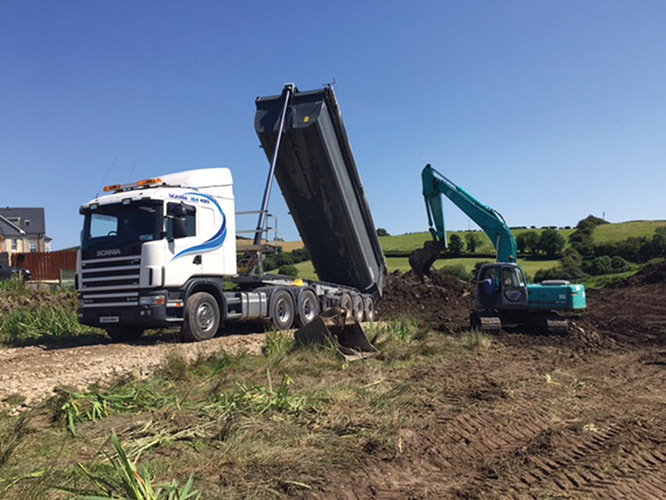 “The services we provide our customers includes tipper work, bulk excavation, site clearance and mobile crushing,”Managing Director Keith informed Irish Trucker magazine. 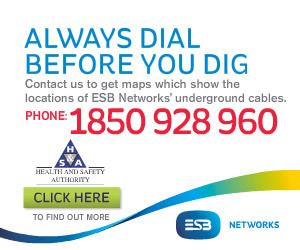 “We cover all of Ireland –we have no fixed abode!”he added laughing. Keith's first introduction to this line of work came when he started out driving a digger for a local contractor. He later branched out on his own and set up Keith Cleary Plant Hire Ltd in 2001. His approach to business is underpinned by the knowledge, experience and motivation to help achieve his clients aims. He boasts a wealth of experience in the sector and that helps to explain why he counts the likes of Priority Construction amongst his long list of valued clients. In the increasingly technical and legislative world that Keith Cleary Plant Hire Ltd operates in, only the best staff and most appropriate equipment will allow the contractor to complete their works safely, within programme and on budget. For equipment, Keith Cleary Plant Hire can call on the wide resources of their own haulage and plant operations to supply the correct machinery for each individual project. Their extensive fleet of machines includes three 210 Kobelcos, a Cat 312 and a Volvo BL360. Keith is continuously investing in the company's fleet to meet their customers requirements. At all times, he endeavours to provide the most modern and high performing machines currently on the market. For instance, as recently as last April, the company took delivery of four brand new Schmitz tipping trailers from Ashbourne Truck Centre. Their fleet is regularly serviced which means their work can proceed uninterrupted by the delays caused by inadequate or faulty equipment. “Business seems to be going well at the minute,”Keith revealed. “We've a big muck shifting job on in Donegal town at the minute. We've just finished a job in Garvagh, County Derry on behalf of Priority Construction. We do a lot of work with Priority Construction, P McCaffrey & Sons and Norris Plant Hire in Sligo. Keith's ultimate aim for all jobs is to safely complete the works in the allocated time frame to ensure that future sub-contractors can begin work on their respective package. As already mentioned, he takes pride in the high quality service delivered to clients, which is shown by the consistency of repeat contracts. Key to that success is developing transparent working relationships with clients and adding value to projects. “You have to sort out the price with the client right from the start,”he advised. “Then carry out the job. That way there are no comebacks. Do the deal, then do the work, that's very much how I work. If you are looking for tipper work, bulk excavation, site clearance or mobile crushing, Keith Cleary Plant Hire Ltd has all the experience and resources to carry these out professionally and cost-effectively. His aim is simple –to deliver outstanding work that exceed his clients expectations.